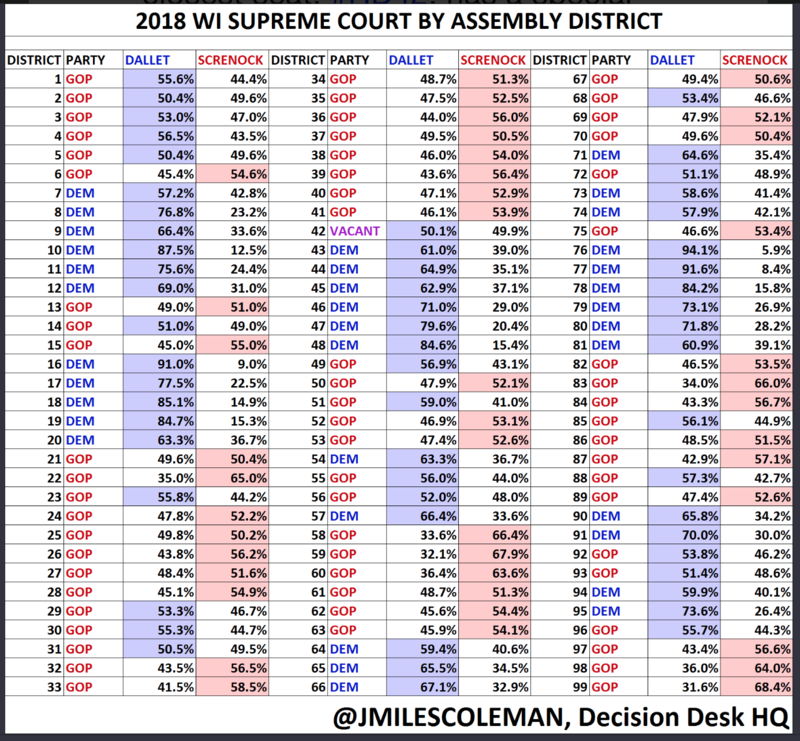 The fate of the current Wisconsin Assembly district map, precision-engineered to maintain a Republican majority in the face of anything short of a major Democratic wave election, is in the hands of the Supreme Court, which could announce a decision in Gill v. Whitford any day. One theory of gerrymandering is that the practice isn’t much of a problem, because the power of a gerrymandered map “decays” with time — a map that suits a party in 2010 may, due to shifting demographics, be reasonably fair a few years later. How’s the Wisconsin gerrymander doing in 2018? We just had a statewide election in which Rebecca Dallet, the more liberal candidate, beat her conservative rival by 12 points, an unusually large margin for a Wisconsin statewide race. I don’t think the gerrymander is decaying very much. I think it’s robust enough to make GOP legislative control very likely through 2020, at which point it can be updated to last another ten years, and so on and so on. This isn’t the same kind of softcore gerrymandering the Supreme Court allowed to stand in 1986, and I hope the 2018 Supreme Court decides to do something about it. What is the median length of homeownership? The median length of time people have owned their homes rose to 8.7 years in 2016, more than double what it had been 10 years earlier. The accompanying chart shows that “median length of homeownership” used to hover at just under 4 years. That startled me! Doesn’t 4 years seem like a pretty short length of time to own a house? When I thought about this a little more, I realized I had no idea what this meant. What is the “median length of homeownership” in 2017? Does it mean you go around asking each owner-occupant how long they’ve lived in their house, and take the median of those numbers? Probably not: when people were asked that in 2008, the median answer was 10 years, and whatever the Times was measuring was about 3.7 years in 2008. Does it mean you look at all house sales in 2017, subtract the time since last sale, and take the median of those numbers? Suppose half of all houses changed hands every year, and the other half changed hands every thirty years. Are the lengths of ownership we’re medianning half “one year” and half “30 years”, or “30/31 1 year” and 1/31 “30 years”? There are about 75 million owner-occupied housing units in the US and 4-6 million homes sold per year, so the mean number of sales per unit per year is certainly way less than 1/4; of course, there’s no reason this mean should be close to the median of, well, whatever we’re taking the median of. Basically I have no idea what’s being measured. The Times doesn’t link to the Moody’s Analytics study it’s citing, and Dougherty says that study’s not public. I did some Googling for “median length of homeownership” and as far as I can tell this isn’t a standard term of art with a consensus definition. As papers run more data-heavy pieces I’d love to see a norm develop that there should be some way for the interested reader to figure out exactly what the numbers in the piece refer to. Doesn’t even have to be in the main text. Could be a linked sidebar. I know not everybody cares about this stuff. But I do! But even if Hyundai is eventually forced to pay the full amount of the damages, the punishment could be substantially reduced through a tax loophole that permits the company to save millions of dollars by deducting any court-ordered punitive damages as an ordinary business expense. The result, critics say, is that taxpayers are in effect subsidizing corporate misconduct. What’s terrible about this isn’t that companies are allowed to claim the fines they pay for malfeasance are an ordinary business expense. What’s terrible is that it’s true. Update: I misspoke, as a commenter points out. A “fine” — that is, a penalty you pay to the government — is not deductible. What may be deductible are punitive damages, paid to people you injured or whose river you despoiled. Prepare your return accordingly! Obama flip-flops faster than I can blog! Prezzo has already walked back his proposal to change the 529 college-saving tax break, but I have a post about it queued up, and by gum I’m gonna publish it. OK, this Congress is as likely to roll back a tax break for high earners as they are to rename Reagan National Airport after Pete Seeger, so this isn’t actually happening, but I’m just saying, that’s the plan. He went as far as saying that the proposal could be characterized as a broken promise. “People saved money in 529 plans because of the expectation that the favorable tax treatment would continue,” he said. But why does the New York Times let Mark Kantrowitz say this when it’s plainly not true? I saved money in a 529 plan. And the favorable tax treatment for that money will continue. When I take it out, I won’t pay a dime on any capital gains. A broken promise would look more like a state government defaulting on money it owes the thousands of middle-class taxpayers whose pensions it mismanaged. Winning statewide as a conservative Republican in Wisconsin isn’t easy. Even though five of its eight congressmen are Republicans and the GOP controls its statehouse, Wisconsin is a very blue state. It’s historically been a union stronghold, and it hasn’t gone Republican in a presidential race since 1984. For progressives, the Republicans’ fragile hold on state government is an insult, an affront that should be corrected. Wisconsin is not a very blue state. In those 30 years since 1984, a Republican has been governor for 19 of them. In both 2000 and 2004, the Democratic candidate won Wisconsin’s electoral vote by less than half a percentage point. In 2012, Obama won Wisconsin by 7 points, in a year he won nationally by 4 points. So Wisconsin, in Obama’s home turf of the Upper Midwest, was slightly bluer than the country that year. But it’s not California or Maryland. It’s not even New Jersey. It’s a state that’s half Republican and half Democratic. (See also: “It’s a recall, not an omen.”) That’s why elections here are close. Despite what Woodruff writes, neither liberals nor conservatives think they have a right to own the state. Walker has the advantage of incumbency and he’s probably going to win. That’s important for his dreams of a Presidential run; but I don’t think it has much to say about national politics. All attention is focused on Mary Burke and Scott Walker, so I didn’t even realize there’s a state ballot proposition in next week’s election. And it’s not a trivial one, either. But I’m voting no. I don’t expect every dime of people’s property taxes to support upkeep of residential infrastructure. I don’t think the sales tax should be restricted to promoting Wisconsin retail. I think money is money and it’s the job of the legislature, not the constitution, to decide how money can best be raised and where in the state it’s most needed. The amendment prevents gas taxes and vehicle registration fees from being used to fund schools and hospitals and police, but it doesn’t prevent other revenue sources from being raided to fund our highways and bridges. And that’s what’s actually happening right now; the current administration takes $133 million from the general fund to fund transportation in the current budget. I’m not sure why transportation, out of all state projects, ought to enjoy a special status: allowed to draw money from the general fund, but constitutionally prohibited from releasing any back. The amendment establishes one class of spending and taxing as privileged above all the rest. It shouldn’t be part of our state constitution. How do you share your New York Times? My op/ed about math teaching and Little League coaching is the most emailed article in the New York Times today. Very cool! Why are some articles, like mine, much more emailed than tweeted, while others, like the one about refugees, much more tweeted than emailed, and others still, like Krugman’s, come out about even? Is it always the case that views track tweets, not emails? Not necessarily; an article about the commercial success and legal woes of conservative poo-stirrer Dinesh D’Souza is #3 most viewed, but only #13 in tweets (and #9 in emails.) Today’s Gaza story has lots of tweets and views but not so many emails, like the Honduras piece, so maybe this is a pattern for international news? Presumably people inside newspapers actually study stuff like this; is any of that research public? Now I’m curious. About 30 percent of heart attacks, strokes and deaths from heart disease can be prevented in people at high risk if they switch to a Mediterranean diet rich in olive oil, nuts, beans, fish, fruits and vegetables, and even drink wine with meals, a large and rigorous new study has found…. Scientists randomly assigned 7,447 people in Spain who were overweight, were smokers, or had diabetes or other risk factors for heart disease to follow the Mediterranean diet or a low-fat one. Low-fat diets have not been shown in any rigorous way to be helpful, and they are also very hard for patients to maintain — a reality borne out in the new study, said Dr. Steven E. Nissen, chairman of the department of cardiovascular medicine at the Cleveland Clinic Foundation. Now, I am not a low-fat dude. Long ago I dated somebody who was into Dean Ornish and every time she “sauteed” onions in water a little piece of me died. I pour a lot of olive oil on things, because I like it (especially Frantoia, which the guys at the Italian grocery in the Trenton Farmer’s Market turned me on to when I lived in Princeton) and because mainstream nutritional wisdom has been promoting monounsaturated fats for a long time now. But I do think low-fat gets kind of a bad rap from the NYT piece. Even more so in some of the other coverage, like the LA Times, which headlines their story “Mediterranean diet, with olive oil and nuts, beats low-fat diet.” The Times, at least, points out far down in the piece that the “low-fat” group, while counseled to reduce fat, didn’t actually do so. To get numbers, you have to go to the supplemental material of the original paper. There, you find that the Mediterranean eaters were getting 41% of their calories from fat, while the “low-fat” arm got 37%. A low-fat diet is 22%. Random googling suggests that most vegans are getting 20%-30% of their calories from fat. In other words, the study doesn’t really show that the Mediterranean diet is better for you than eating low-fat; it shows that hardly anybody is capable of eating low-fat, which is a different thing entirely. And now UW-Madison has gotten into the act, announcing yesterday that UW would be offering four courses with Coursera, two to start this fall. Readers: would it be a good idea, a bad idea, or some combination of both, for me to propose to teach a number theory MOOC? Doesn’t the word “hits” there kind of make you think the rate rose to 7.8%? But no, it was 7.8% last month too, and is down from 8.5% at the end of last year. which gets the constancy of the unemployment right — but “steady” alone conveys a misleadingly sunny impression.